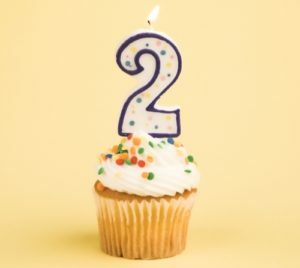 We can’t believe it’s been two years since we changed our name from ATXAHH to Austin Humanists at Work. The time has flown by, and it has been a wonderful ride. We’ve seen the amount of people that we serve rise (especially in the last year! ), and we’ve had a larger amount of volunteers to meet that need at each giveaway. We’ve also seen the amount of donations increase steadily, which is fantastic. 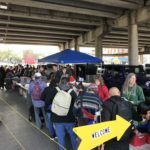 ATXHAW couldn’t do what we do without our amazing volunteers and donors. It’s times like this when words just aren’t enough – we’d love to hug each and every one of your for your contributions! But since we’re blogging, a huge THANK YOU! will have to do! As you may remember from last year, our 1st birthday celebration included hard boiled eggs and cupcakes. 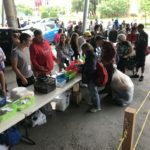 This year, we are asking volunteers to bring treats again, and have expanded the list to also include cookies, fruit, and non-perishable snacks (tuna, peanut butter, meat sticks, etc.). We’ve added some new snack options to our Amazon wish list, so even if you can’t join us in person, you can still give our clients a treat! What donations do we need? We need underwear! We’re out of both men’s and women’s underwear, along with men’s socks & nail clippers. 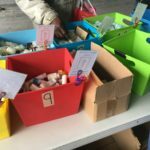 We’re also low on many other items, including women’s socks, lip balm, hand sanitizer, sunscreen, and condoms. For a complete list of what we do and don’t need for next weekend’s giveaway, please visit our What Do We Need? page. Do you have a donation that you’d like to get to us? Awesome! We have a donation bin at Pak Mail Metric. Their address is: 11900 Metric Blvd. #J, Austin, TX 78758. They are open Monday – Friday from 9:30 AM to 6 PM and Saturdays from 10 AM to 1 PM. Can’t get to Pak Mail? That’s OK – email our donations coordinator to schedule a pick up: donations@austinhumanistsatwork.org. 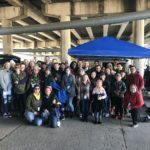 We have volunteers all over the Austin area! You can also send ATXHAW a donation via Amazon. Our wish list has all of our staples, and your donation will be mailed directly to us. You can see what we need the most if you sort the list by priority. High Priority = Green Light, Medium Priority = Yellow Light, and Low Priority = Red Light. Thanks again to Phi Theta Kappa and the Foundation Beyond Belief! Earlier this year, we received a grant from the Foundation Beyond Belief that allowed us to purchase supplies for 1,000 first aid kits. 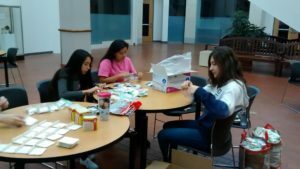 Last month, volunteers from Austin Community College’s Alpha Gamma Pi chapter of Phi Theta Kappa assembled 500 of the first aid kits, and this past Thursday, they completed the other 500. Each first aid kit contains 5 band-aids, 4 antiseptic wipes, 2 gauze pads, and 2 knuckle/fingertip bandages. 1,000 first aid kits should last us anywhere from 5-7 months. 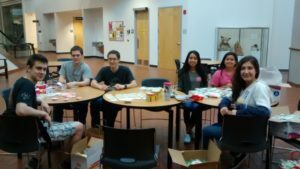 We are very grateful for the PTK volunteers’ time and effort! Are you looking for a new hobby? 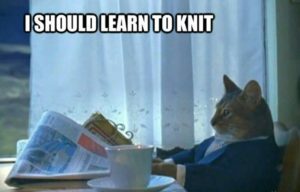 How about knitting or crocheting? We’re looking for people to create hats, scarves, and cotton washcloths for the ATXHAW giveaways. 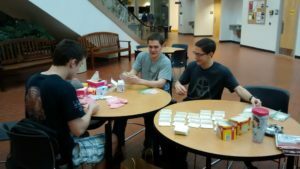 The cotton washcloths are a great way to practice your skills! Come learn how at this month’s Gettin’ Knotty meetup. The group will be in the cafe area of Barnes & Noble in the Arboretum this Thursday, April 12, from 7 PM until 10 PM. Thank you for reading! We hope you’ve gotten to see some of the beautiful Texas wildflowers this month! See you on the 15th!